Why the world needs Super Legal. You are the show I need. You are also the show I deserve damnit. Must see this to fruition! 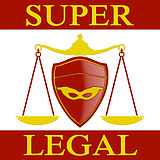 Everything you need to know about Super Legal in one handy PDF. SUPER LEGAL Top 15 Live Event. November 7th, 8PM At Johnny Jackson, Toronto. An evening of stand up comedy from show creator Andrew Ivimey, as well as guests Craig Fay and DJ Demers, two of Canada's finest comedians and both Just For Laughs festival performers. The evening will also include a world sketch comedy premiere from the creators of Texts From Superheroes. Plus a karaoke after-party DJ'd by our very own Captain Eagle, Wil McLean. Yeah, this is a neat concept. People are into superheroes (so my human counterparts have told me), and perhaps there would be an extra draw of audiences who are into more cerebral stuff, which is where the law angle is handy. Super legal! Super duper! Congratulations on your Comedy Coup videos so far. This is an interesting and unique concept. All the best to your team and I wish you well on advancing to the next stage of this contest! I agree with others, great potential. I would be interested in seeing how this translates with amped up production. You have caught my attention! What a first class sales pitch for what appears to be a very funny story. Scared of the wolf, but the super heroes are fantastic. Good luck collecting votes and support! Good job, this can be a series that can work and get great responses. Good cast and creativity as well. Hope you guys get to the next stage in this competition. Great work, tons of potential. Ill be watching. Congrats on making the top 55 and good luck in the rest of the voting. Wishing you the best in the competition, your good friend Sharon. Great work – looks like this project has a lot of potential to make it to the top 15. Looking forward to your week 6 submission!! Superlegal wasn't may fave out of the projects but you can tell you put time into it. Congrats on getting to Top 55! All the best on your journey to Top 15! Not sure we need another "super" show...............unless is really is a super show! Good luck and keep on making people laugh! I hope you guys make it to the next round, I've loved everything you've done so far and I can't wait to see more. Good job hitting all the marks with this week's mission. You described your show very well and sounds like just the off-beat concept that could do well. Lots of potential ideas for many scripts! Well done! Wow. I am kinda bummed that I didn't see this one until just now. This is easily one of the best concepts or there so far in my opinion. I hope this one hits top 15 for sure. Interesting concept, being that there are several superhero buffs in the world I could see you becoming quite successful - especially if given a strong budget for special effects and wardrobes. Not a big super hero fan. Like legal shows. This looks like it has potential and your video explains what you are about well. I don't think you are in my top 15 but good luck in the final voting. Very good hype video, informative and personal... you guys are dynamic and accomplished - hope you make it to the top 15! Nice fresh approach to this concept! Great job on this mission video. Hope to see you guys in the top 15! Keep up the good work and keep up the good funny (that doesn't make sense). I feel like tapping into the popularity of superheros is a smart move. It would be interesting to view them from this angle! hey , i think that the concept is original and i think that there is definitely something to do with this, though i thought that this last video was a bit simple and not that original . something more that ''talking to the camera'' would be great. good luck ! I had not viewed this project until today, but I have to say it's one of the top concepts in this competition. With all the comic book film adaptations going on right now, there's no end to the possibilities for comedy and parody. On the surface, it might seem like a one-gag concept, but with good writing and character work, this could be a great series. However, the work will have to be exceptional, as this does make me think of a lot of decent potential series that never finished the first season. There's a lot of possibilities with this concept. Interested to see how you bring the reality of the relationships in to a fantastical world. Congrats. really enjoy your guys concept (and from what I've seen the actors and writing) tons of good shows on here, and I hope to see yours made. I really like your concept! Your Hype video is also a clear explanation of the concept, and your sell sheet really gets that across. Loved the costumes, and also the way you interspersed face to camera and shots from you projects. Nicely done! This was well done - lot of thought into character definition here which is a departure from some of the other entries. great stuff here guys. really funny and professional. certainly wouldnt be surprised to see you make it through to the next round and you definitely deserve it! I love the idea of the antihero. This has a lot of potential to be very funny, and I hope you do well going forward. looking forward to this week's submission. The concepts very cool, hope it's successful and hypes the media up, because it hyped me up to watch some more of your stuff. Great job. Cool concept and cool special effects. you guys have lots of talented folks on here. My main question is, will this work as a series? I can see it maybe go for one season, max two. nonetheless, wish you the best. Are you going to do an episode that deals with a super hero stopping a suicide and then being sued for it? Play out the opening of The Incredibles for a while three act story. It obviously needs to end with the hero agreeing to kill the guy or gal who wanted to die in the beginning. Take it dark as hell. I like your concept and it is unique and interesting, eh! If only Larna was a really person not just a character, she can make sure Super Legal wins, Good luck guys I've done all I can I've voted each time I can only hope you guys win. I would love to have seen a bit more comedy from the characters in this video. That said, I like the concept. Cool concept for this project! Sounds like you have a lot of talented people on board.. nice touch referencing Wolf Cop ha ha. I would be curious to see how you guys "Flip" your concept around if you make it into the top 15 this weekend. All the best from the east coast, and good luck! Congratulations on making it to the top 55! I like the idea behind this show and your crew sounds well experienced. Keep working hard and earn yourself a spot in the top 15! Great job folks! I really like the premise, and you guys bring lots of fun to the screen! I do want you to go a little more crazy, I think you can stretch the reality even more then we've seen here. Also, you should try and hire Dean Cain, I'm sure he's available (even if it's just to do some housework and make coffee). Stay tuned for The Eligible Bachelors week 6 vid, it will be truly be "cray"! The Superlegal team has a great premise, it'd be nice if the idea itself was hyped up a bit more, I think of like, wolverine as a judge, cyclops as a lawyer, Rogue as a cop. Getting the real wolverine, hugh jackman? That would be hype... and easy... right? Good luck guys! Good luck keep it up! Like the concept, might need a bit of tweaking, but keep it up! I like this concept, I've been watching your videos and you seem to have a good premise, something that could have a good arc and character development. Good luck!! This seems interesting. I'm glad that you stuck to this weeks mission, some teams didn't seem to answer it that well. Good luck with the competition, it would be great to see more from you guys. Your week 5 submission was well thought out. Curious to know more about character development - how will they advance? Good luck making into the top 15! Great video; like the way you talked, how you explained your project, and what are your aspirations. I think you have a good idea for a show, it could be funny and interesting. Best luck to your team! I guffawed aloud at Wolfcop snarling. The other posters are correct. This is one of the best of all the mission 5 projects. I can't help but enjoy the idea of him defending Wolfcop. This weeks challenge was really well done. You got everything you needed for a pitch to the media quickly and concisely. I've been watching a lot of the week 5 submissions, and this one is among the best. I like the concept of the show, I am interested to see where you go with it. This is a really cute and fresh idea. It looks like you are all well experienced and would be able to carry a project like this through to fruition. Interested to see where it goes. an 'out there' concept but enough to keep me interested. good chemistry and funny stuff here. best of luck for the 15! I love the ides that have a bit of craziness to it. This has that but also keeps it grounded as best it can. Would love to see the week 6 challenge for this idea to see how far you guys are willing to take this! Week six will be a fun one for ideas like this! I hope you get into the top 15 so we can see it! Congrats on top 55 and good luck with the 15. Wolves and lawyers - what a concept!! Aren't they the same- HA HA. Good concept. Looking forward to seeing them in the next round. Good luck and look forward to seeing your next video. I can't wait to see this one go all the way. Laura's just great and the whole concept just feels so fresh and unique. It's the show we deserve, and the one we need right now. Good luck to all of you! This should appeal to a younger generation. Best of Luck! Super cool effects and I like that you try to incorporate wolf cop into your series. Nice plugin. Good luck on top 15. Can't say I got all hyped up watching this video. You did a great job talking about the cast and why you want to win but not that much about the show. Would have liked to seen a bit more of the story line and what's going to make this show a hit and a must see. Congratulations on making it to the top 55. Your hype video and sell sheet were well done. Good luck on making it to the top 15! Good work, Super Legal. Really well done! It's so hard to explain the breadth of a concept in 90 seconds but you nailed it, doesn't feel rushed and I know exactly what you're making. Could include more about the team and their motivations for making this show but I think you nailed it. I like The Hype! Go Go (to) Top 15! Never enough clean cut super hero stories to inspire the youth. "The show Canada deserves and the one it needs" even your pitch is nerdy, Andrew! Love it. Great breakdown of the project. You know I love this show idea. I'd love to see ideas for other heroes & villains we can expect to see through the series. What an interesting idea combining super heroes and courtroom antics. Could have some great possibilities and opportunities for real comedy. Good luck in the competition. I thought this contest was about giving new talent a chance. Why is someone who already had a movie here. This doesn't make sense. You guys already have a foot in the door. Thanks for your comment Virginia. I believe you may be referring to our Director Doug Groves and his credentials referred to in this video. Doug has 17 years in the industry working in post production at a production house. He is a very experienced and valuable member of our team but has not previously had creative control of a movie or television project. Thanks for your concern and hope you enjoy the rest of our videos. Am I supposed to comment on my own show? Does this count for my fan badge? I guess I'll find out. Oh, I liked it! 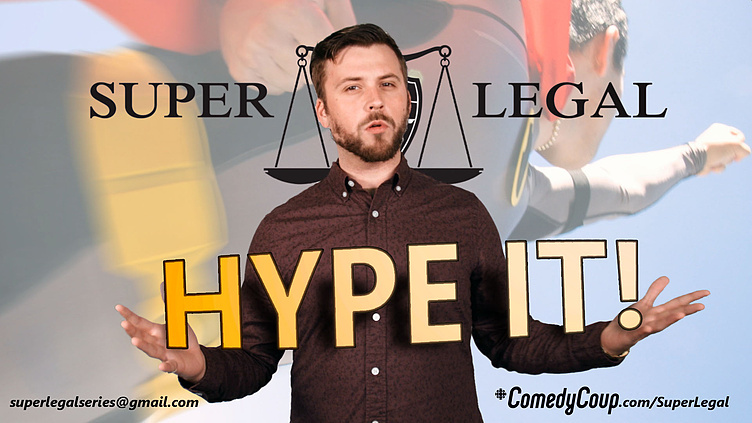 Super Legal is the bee's knees! Very professional - looking video w great explanation. Impressive. Congratulations on making it into the top 55 and good luck going forward into the Top 15. I am waiting with baited breath. Congrats on Top 55! Great job explaining your show concept. I've never seen your videos before and this totally caught me up. Love the Wolf Cop humour! I like the idea of being able to say "Well, I mean, it's not exactly suuuuper legal, but you know." I'm not going to be able to say it often, but when I do, I'm going to say it with much relish. And maybe a little mustard. Great show. You explained your concept and cast very well. I hope to see you progress further in this competition as you have such an original and funny idea to work with. I like your format. Informative, interesting, some nice clips and a good sell. Wise to bring in creators from a few provinces, gives broader perspective. Very informative! I love the idea of Saul Goodman meets superhero stress, keep it up, keep it fresh, and hope to see you in the top fifteen! So many superhero shows these days, I'm intrigued to see your spin. This video was clear and professional. I think it looks good and would like to wish you all luck for the top fifteen! After watching the week 5 video I was trying to imagine what type of legal problems that a superhero might have, but your sell sheet answered that question for me. Well done! This could be funny and worth another look. Very clear and concise video. Really captured what you guys are all about and presented it very well to the media. Also congrats on your articles and the podcast. I bet your stand-up comedy event is also going to be pretty fun. If I were to attend this Live Event on Friday, is there a dress code? Cloaks and/or cowls? Cloaks and/or cowls are not mandatory, but are encouraged! You can come dressed however you please as long as your dressed. You did what the mission asked for, but just not as good as some other teams have done, Other than that i would have liked it to be a little more on the funnier side. Good luck with your SUPER LEGAL Top 15 Live Event Friday night. Very business like. I want to laugh though, don't make this like a job for me, don't do it. Lots of possibilities with this concept but I want more about characters. I'm wondering about some of the nuts and bolts of this supper powered world. How exactly will the show avoid the ruin of all supper hero universes, powers creep. At some point the power of the heroes / villains is so great that plots begin to boarder on the absurd and the original appeal is lost. Plan to avoid that. this weeks challenge was well done. It was well edited, had eye catching pieces, and explained everything clearly. Nice clean clear video, well done. I like Legal stuff. I like Superheros. I like you guys!